The Wagner Innovation Labs are a new series of policy experiments that marry theory and practice to promote informed, evidence-based decision-making in a complex world. Each project reflects NYU Wagner's broad commitment to bringing scholars, thinkers, and practitioners together, both figuratively and literally, to improve the way policy is made. Wagner Innovation Labs director, Neil Kleiman and Harvard professor and former mayor, Stephen Goldsmith announce the publication of A New City O/S: The Power of Open, Collaborative, and Distributed Governance. Despite enormous changes in technology and society, for more than a century the basic structure of government has not changed. A New City O/S presents a model that will reverse declining levels of government trust by modernizing outdated systems, placing residents in the center of operations, focusing on outcomes and changing the way public employees work. Few measures are available for cities to assess health, the factors that shape it, and the drivers of health equity. The just launched City Health Dashboard addresses that gap. It provides city leaders with an array of regularly refreshed data to support health-related decision-making. 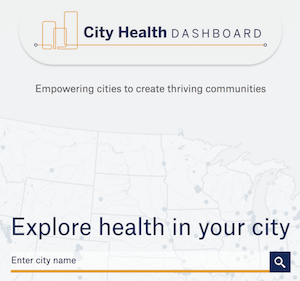 With support from the Robert Wood Johnson Foundation, the Dashboard offers data on 36 measures for the 500 largest U.S. cities - those with populations of about 66,000 or more – representing approximately one-third of the U.S. population. Equipped with these data, local leaders have a clearer picture of the challenges facing their communities and how to address them. The Dashboard can be accessed here. 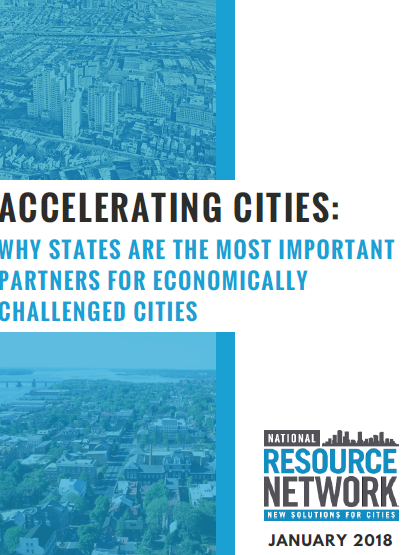 Accelerating Cities: Why States Are the Most Important Partners for Economically Challenged Cities, provides recommendations for states to effectively work with cities and includes case studies and data from Virginia and New Jersey – two states with incoming governors and cities that have significant economic challenges. The report claims that state governments can be crucial partners in supporting the turnaround of economically challenged cities, but too often states are afterthoughts in these discussions. In states like Virginia and New Jersey and others around the country, there are great opportunities for better partnerships to drive change.